A well-designed heat pump system transfers significantly more energy into a property as heat than is uses to extract it from the ground or air. As a result, heat pumps have the potential to lower fuel bills, particularly in properties without access to mains gas, and reduce environmental impact. Heat pumps work by extracting solar energy stored naturally in the ground or air. They are able to utilise this energy for domestic heating and hot water. In a well-insulated property, every kilowatt hour (kWh) of electricity used to power the heat pump can provide around three kWh of ‘free’ thermal energy. This means that a heat pump’s efficiency can reach around 400% – far more than boilers that tend to run at around 92%. Is a heat pump suitable for your project? Heat pumps are a good renewable alternative for a range of properties. Is the property very well insulated? Insulation should be up to current Building Regulation standards to ensure the heat pump both effectively and efficiently heats the property. This is why most heat pumps are installed as part of a new build project. Is there access to mains gas? If the answer is no, then a heat pump could be a particularly cost-effective choice. This is because for every unit of electricity the heat pump uses, it typically outputs three times the amount in heat energy. You can expect a heat pump to be more efficient and cheaper to run than an electric-only heating system or an LPG boiler. How much land is available? Ground source heat pumps need a good amount of land for the installation of ground loops – at least three times the total floor area of the property (ground and upper floors). 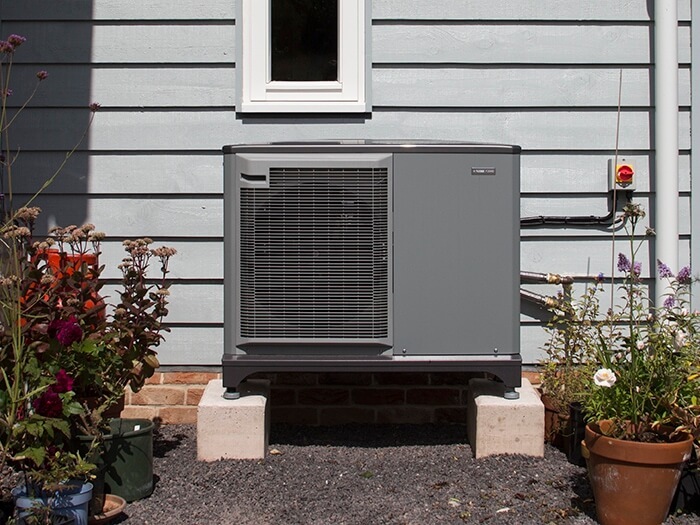 Air source heat pumps require very little space, so are a good option for urban properties. Underfloor heating (UFH) is the most popular heat emitter to pair with a heat pump system. This is because UFH works at much lower flow temperatures than a traditional radiator system, making it ideal for heat pumps which are at their most efficient when operating at low temperatures. Why choose a heat pump from Nu-Heat? ✓ We provide a complete heat pump design and supply service, ensuring seamless system integration. ✓ Our experience and intelligent software delivers maximum efficiency for the homeowner. ✓ All Nu-Heat heat pumps are MCS approved and our documentation is also MCS compliant, supporting Renewable Heat Incentive applications. ✓ We make installation easy with straightforward instructions and comprehensive mechanical and electrical drawings. ✓ Heat pumps are guaranteed for 7 years when supplied and commissioned by Nu-Heat.